The Yellow-Bellied Slider is a subspecies of the pond turtle and is native to parts of the US. 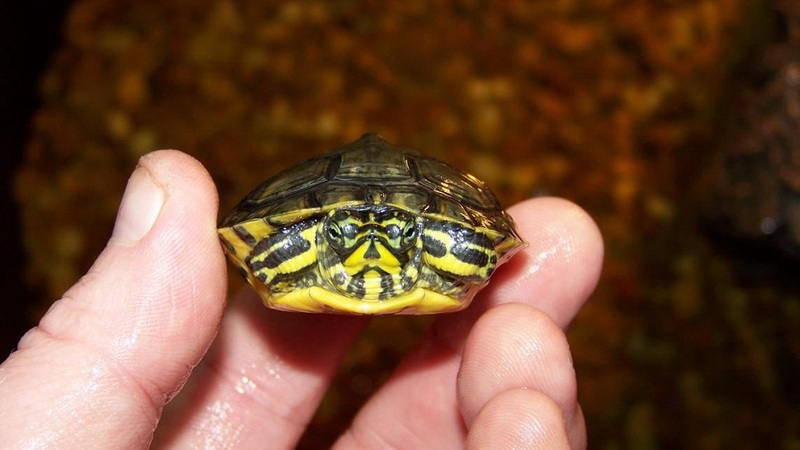 It is the most common turtle in its range and is very much popular as an aquarium pet. 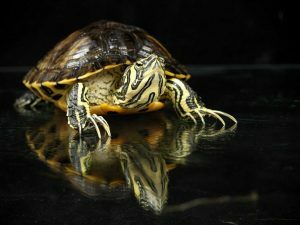 Yellow-bellied slides are often confused with the red-eared sliders, which have red or orange stripes down the sides of their heads unlike the former, since they both have features in common, as also, share their natural range. Size: A healthy, adult male typically reaches 5 to 9 inches (13 to 23 cm) in length, while a full-grown female of the species is larger measuring 8 to 13 inches (20 to 33 cm). Weight: They have a very light mass. On average, they weigh between 7.7 and 13.8 g.
Carapace & Body Color: The shell of this terrapin has a typical brown and black coloration, often bearing bright yellow stripes, while the skin has an olive green color with distinct yellow patches down the legs and neck region. Sexual Dimorphism: There are no visible differences between the sexes except that the males naturally bear claws, and are smaller than the females (mentioned above). 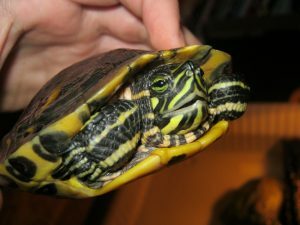 The reptile is native to the southeastern parts of the US, particularly from Florida to southeastern regions of Virginia. Yellow-bellied sliders mostly prefer still water bodies like ponds and are found in slow-moving rivers, marshes, floodplain swamps, etc. and frequently colonizes seasonal wetlands like Carolina bays. Except for terrestrial excursions, these reptiles mostly remain in water bodies where submerged and floating vegetation is abundant. 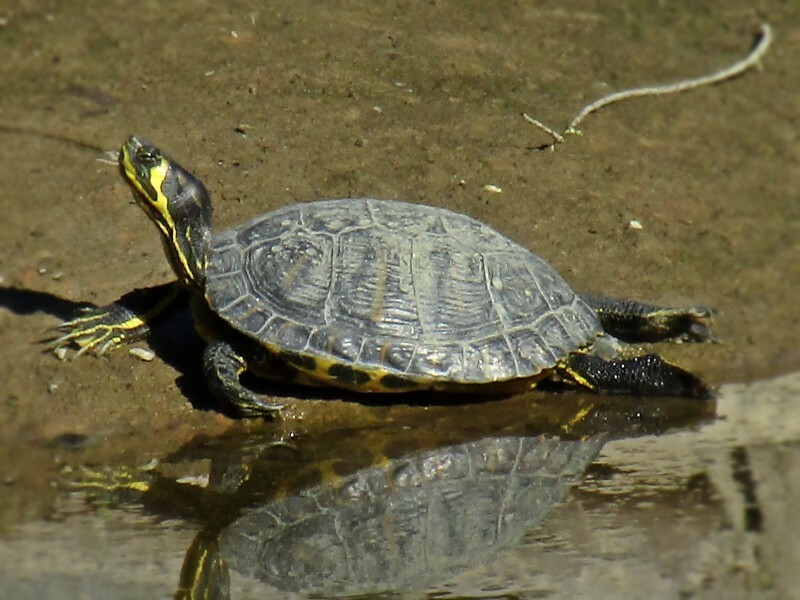 These turtles are semiaquatic and are one of the most abundant of all basking turtle species. They are seen resting on logs, stumps or rocks, individually or in groups, during fall and spring, or at any time when the weather is dull or mild, and the sun is out. They communicate with each other by means of touch and vibrations, and have very good eyesight. These turtles have the habit of stacking on top of each other by the pond side. They are diurnal and usually spend the night sleeping underwater. However, they are also seen floating on the water surface. During winter, when the temperature goes down, they usually become inactive. 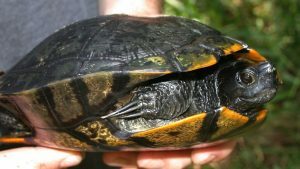 Their activity level goes down, especially when the temperatures go down below 10° C.
They will usually hibernate between November and February often underwater, under the banks of ponds, hollow stumps, etc., and come out between early March and late April. 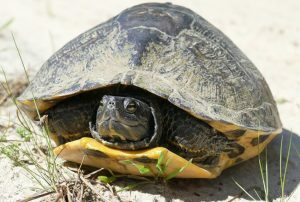 While they prefer staying mostly in the water, they would move on land at times to lay eggs in a terrestrial nest, or to and from their hibernation sites. They are otherwise gentle-natured; however, males are sometimes aggressive towards each other during the mating season. These reptiles are omnivorous and feed on both plant and animal matters, including insects, dead fish, tadpoles, aquatic crustaceans, and other meat items. Plant matters in their food list include fruits, seeds, leaves, stems, roots, and algae. However, they tend to be more carnivorous with their diet consisting of 70% of animal matters and 30% plant matters. 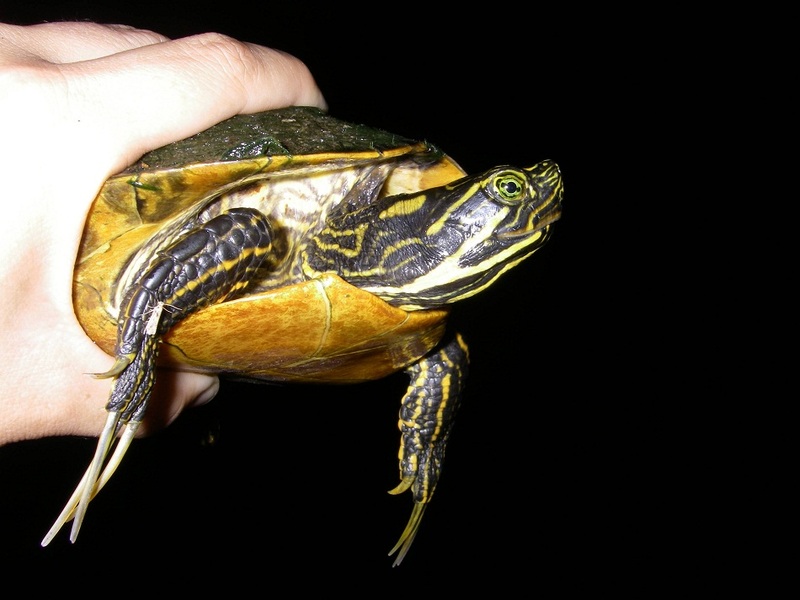 The mating season of this slider is spring when the male yellow-bellied sliders have been observed displaying courtship behavior by performing a specific mating dance. However, some individuals have also been seen exhibiting the same during fall and sometimes winter. 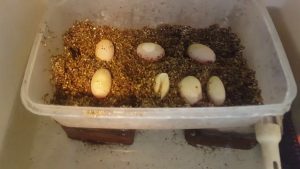 After mating the female yellow-bellied sliders begin building their nest cavities by digging soil using the rear feet where they lay their eggs soon after. The litter size (number of eggs) varies between individual, being influenced by factors like body size and age. 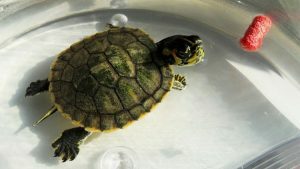 It takes about three months for the baby turtles to hatch out. The hatchlings stay in their nests during fall and winter and emerge in the next spring, after which they enter the water for the first time to begin feeding. The young sliders attain the age of sexual maturity when they are around 4 to 5½ inches in length. They have the ability to inflate their throats to keep themselves floating. 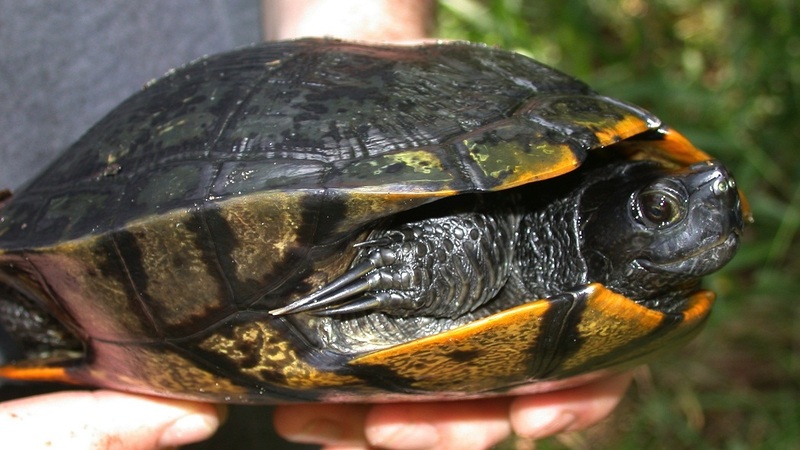 The brown and olive coloration, as also the bizarre and bright pattern on the carapace of the turtle, create a visual paradox that helps them camouflage among the grasses, as well as other land and floating vegetation. In the wild, the primary enemies of the yellow-bellied sliders are raccoons, striped skunks, Virginia opossums, and red foxes. Considering their static population and growth rate, the IUCN 2.3 has enlisted them as ‘LC’ (Least Concern). It gets its name ‘slider’ from its habit of ‘sliding’ or retreating quickly from the land into the water the moment they feel threatened. With age, the adults tend to become more ‘vegetarian’, consuming less and less meat, and eventually, up to 95% of their intake turns to plant matters.